Manhattan, NY After earning recognition for its prototype for affordable housing in infill lots, the architecture firm RKTB see their new commercial office building, 433 Broadway, as a prototype for cities needing more shared workplaces, known as coworking spaces. 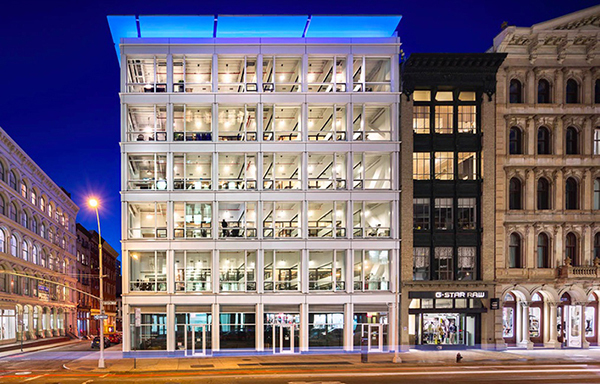 Designed from the ground up for the needs of a coworking facility called Cubico, the white metal building in SoHo features floor-to-ceiling windows, flexible floorplates, and plug-and-play utilities and interior systems. What makes 433 Broadway different is its gesture to the cityscape: It reads as a modern version of the SoHo Cast Iron Historic District’s classic loft façades. These buildings have attracted young professionals and entrepreneurs to downtown coworking in the first place. The developer Omari Properties, Cubico offers glass-enclosed workstations as small as 90 s/f to 350 s/f, and 120 companies currently occupy the building, with 85% of the office space leased. Above the street-level retail spaces, five floors of individual workspaces are separated by glass partitions, flooding the volume with natural daylight, plus shared bathrooms, kitchens, and meeting rooms. “Coworking is among the most important business trends of our time, and it’s a ripe opportunity for typology explorations that meet cutting-edge real estate criteria while also addressing the mindset and functionality of today’s shared workplace,” said Carmi Bee, FAIA, principal at RKTB. The CEO of Cubico, Edan Abehsera, said that buildings like 433 Broadway “could be the new normal,” as trends continue toward greater coworking demand.